LOUISVILLE, Ky.–Research released by the Grinnell College Department of Biology concludes that the use of copper alloys on high–touch athletic center surfaces lowered bacteria count by an average of 94 percent. The Grinnell study, published in October by the American Journal of Infection Control, looked at the effect of using copper on commonly–used pieces of equipment, including four types of weights (dumbbells, barbells, kettlebells, and specialty dumbbells) and three types of attachments (grips, lat–pulldowns, and low–rows). Staphylococcus was the most common type of bacteria found on surfaces that the research team tested. In recent years, a virulent form of this bacteria, MRSA, was discovered to have infected players in professional, collegiate and secondary school team sports. 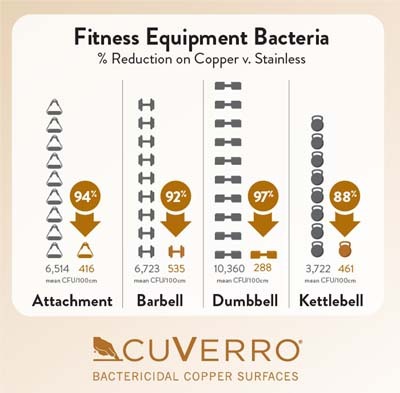 Athletic facilities at Villanova, Purdue, Bellarmine, and others are now using weights made with CuVerro® copper to help ensure the health of athletes. The study found that dumbbells were by the far the "dirtiest" pieces of equipment tested at the new Grinnell College Fitness Center, a popular health facility for students, athletes, and faculty in Grinnell, Iowa. "Our study highlights the ability of athletic surfaces to serve as reservoirs of bacteria," according to Associate Professor of Biology Dr. Shannon M. Hinsa–Leasure, who led the research. Copper's ability to kill bacteria 24/7 is "useful for continuous hygiene maintenance." "Using copper alloys on high touch surfaces, combined with other standard cleaning procedures, could help lessen the spread of infection," she said in a statement. The Fitness Center research is the second major study on copper surfaces conducted by Hinsa–Leasure and her team at Grinnell's Department of Biology. The weights in the study were provided by Black Iron Strength® and made with CuVerro® antimicrobial copper. Last year, she co–authored a peer–reviewed Journal article on a study that was the first to show that surfaces in patient rooms quickly re–contaminate after terminal cleaning, even when the room is unoccupied. That study concluded that when surfaces in patient rooms are made of copper, bacterial loads do not rebound, whether the room is occupied or not. CuVerro (www.cuverro.com), with brand headquarters in Louisville, Kentucky, is manufactured by GBC Metals, LLC, doing business as Olin Brass, a wholly owned subsidiary of Global Brass and Copper, Inc. GBC Metals engages in the melting, casting, rolling, drawing, extruding, and stamping of specialized copper and copper alloy finished products from scrap, cathode, and other refined metals.